The crowd was soon surrounded by a sea of purple and white robes as the graduates marched out the doors of the high school led by the Honorary Marshals from the Class of 2017, Jed Kaiser, Emily Moore and Nicholas Zucconi. Oyster Bay High School senior class president Steven Shoemaker led the hundreds of family, friends and onlookers assembled on the front lawn of the high school in the Pledge of Allegiance. The OBHS Chamber Singers sang a beautiful version of the “Star Spangled Banner” under the direction of Meagan Finnerty. Oyster Bay High School Principal Dr. Dennis O’Hara said, “The Oyster Bay High School Class of 2016 has achieved in all areas. I want you to know that I have been truly blessed to have been your principal. You have made me feel welcomed, respected and valued. You have shown me understanding, warmth, compassion and kindness. I love you, and because of my association with you, I am among the richest men I know.” He continued, “Graduates, like you, today marks a departure for me too. “I know this because, that’s what my wife said to me as I left home that morning for my first day as a principal in this wonderful community. Your first day of kindergarten in these schools, was my first day too. We started together and we are leaving together. Thirteen years later, we are wiser, our souls have evolved and we are better versions of ourselves. You have been a blessing in my life. O’Hara turned the podium over to Alexis Gursky to deliver the address of welcome as salutatorian of the Class of 2016. Salutatorian Alexis Gursky delivered the welcome address. Gursky will be attending SUNY Binghamton this fall on a full scholarship. She plans to study bio-chemistry where she looks to begin a pre-med program. She also looks forward to getting involved in student government. While at OBHS, Gursky was a member of the National Honor Society, the National Science Honor Society where she served as president, the Art Honor Society and the Foreign Language Honor Society. During her high school years Gursky was also treasurer of the Student Council and Junior Class Student Council. She served as secretary of the Interact Club and was a member of the Students Against Destructive Decisions (SADD) club. Gursky is also an equestrian and when she is not working at Christina’s Epicure this summer, she will be riding horses. In her address, Gursky thanked the school advisors, teachers, administrators, counselors, custodians and security guards, as well as the board of education. 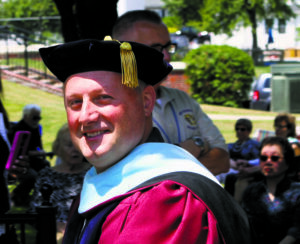 Dr. Dennis O’Hara is an honorary graduate of the Class of 2016. 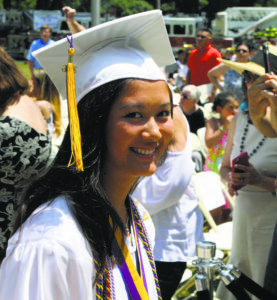 Valedictorian Vanessa Yu gave a heartfelt farewell speech. O’Hara welcomed the valedictorian, Vanessa Yu, to the podium to deliver the farewell speech. Yu plans on attending Yale University in September where she will study biological studies with an eye to beginning a pre-med program. Yu has already committed to play lacrosse for the Yale Bulldogs. 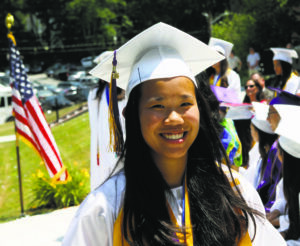 While at Oyster Bay High School, Yu played soccer, track and is an All-County midfielder and All-Long Island second team in lacrosse. 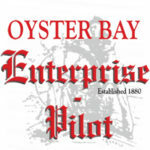 She was a member of the Oyster Bay High School chapter of the National Honor Society, Business and Marketing Honor Society, Science Honor Society, Foreign Language Honor Society and the Student Council. 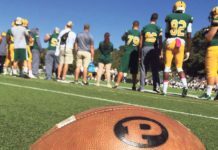 Yu was a NEWS 12 Scholar Athlete and was chosen to receive one of just two Bob Wolf Special Achievement Scholarships selected from all NEWS 12 Scholar Athletes from this year. Yu is an Academic All-American and Athletic Honorable Mention All-American. “Today is our sunset,” said Yu. “Today marks the end of our time spent in the classrooms, on the fields with the rush of adrenaline knowing that we represent the purple and gold jersey and in the auditorium where the sound of our band and choir can be heard throughout the halls. And as our sun sets, we end not on a sad note, but amongst a sky filled with vivid colors. Board of Education president Ann Marie Longo chose to forgo her speech to honor the memory of those dear to the class of 2016 who have passed away and couldn’t be a part of this celebration. 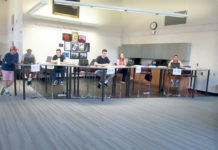 As a parent of graduating seniors, Board of Education vice president Jenifer Romeo took to the podium to ask for a moment of silence in memory of Anthony Petrovic, who the district lost in the fourth grade and to the parents of graduating seniors who will remain in our hearts and memories forever. 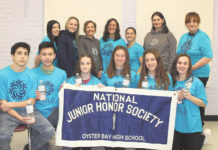 OBHS Chapter of the National Honor Society member, Lia Stanco introduced this year’s choice for the National Honor Society honorary inductee, OBHS English teacher Lydia Brady. 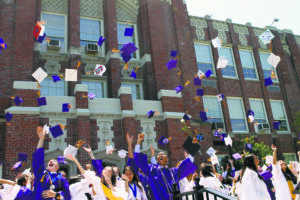 Diplomas were handed out, caps were thrown in the air, then off to parties and the rest of their lives as Oyster Bay High School alumni.